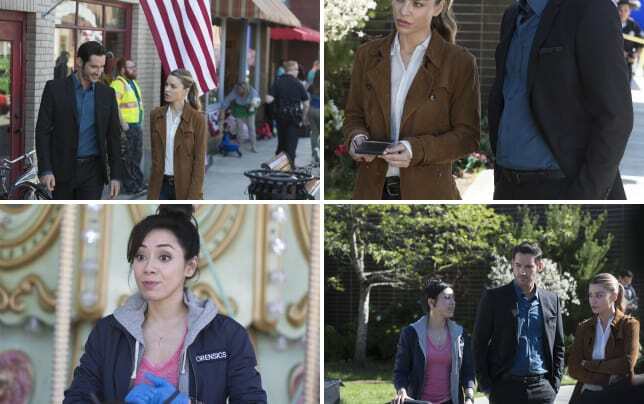 The mystery of mum led the way on Lucifer Season 2 Episode 1 as Chloe and Lucifer investigated the murder of a stand-in actress, and we were introduced to a new character. It's almost like we never left as it's only two days after the events of Lucifer Season 1 Episode 13 where Lucifer almost lost his life and found out his mom had escaped Hell. Lucifer is quite understandably worried about his missing mom, and as we progress through the hour, we realize that her escape has left him far more vulnerable than he even realizes. With the exception of the introduction of Ella Lopez, which I'll get to later, I thought the hour was strong and a lot of fun. And, we were definitely left with some intrigue, right?! We open with Lucifer and Amenadiel at the scene of a jewel heist where they think the leader is their mom in disguise. The odd couple make for a great couple as they question the guy hoping he'll admit the truth of his being. I love when these two work together. Besides, can you imagine how much of a mess Lucifer would be in if Amenadiel wasn't there to help him with this mom business? Turns out that the guy wasn't mum which perplexes them as he's the last person on the list. An exasperated Amenadiel suggests that maybe she's not in L.A., but Lucifer isn't convinced. He visits Dr. Linda to discuss his fears, and he really opens up to her about mom. Even though the "big bang" quip is rather funny, he's not really into his jokes this time. This mum thing is really weighing on him. He can't even get a smile out of Chloe as they head over to start their case of the week: the murder of Jillian, a stand-in actress for Amy Dods, the star of "Leave it to Leslie" (which apparently everyone loves, including Maze). While it worries him for just a second, he's sort of relieved when she tells him she's going to test his blood and find out exactly what he is. This puts him into a more chipper mood until he sees that the victim has metal horns coming out of her head which he immediately thinks is a message from mum. While the devil horns appear to have been the cause of death, Ella Lopez, the new forensic scientist, says that it was actually strangulation and gives us all the other details we need to know. I'm not into the romantic shipping of Lucifer and Chloe right now, but I do love their chemistry. That's why I have a serious problem with Ella. The banter I love so much between our two main characters was clipping along and then Ella entered the scene and the magic was destroyed. Maybe I just need to get used to her, but I see her more as an interruption than a valuable addition at this point. Lucifer works best when it isn't focused so heavily on the procedural elements of the story. Adding a forensic scientist into the mix just throws those procedural elements we happily lost during Lucifer Season 1 right back into the mix. Yes, I get she's there to give voice to God, I guess, but I still don't find her necessary. Her first solo interaction with Lucifer felt stilted and forced as well. I just got the feeling she was dropped into the scenes after the fact. Besides, we have Trixie to hug and repulse Lucifer. Why do we need Ella? I also found it odd that Chloe would ask a coworker she just met about God. Obviously, the question helped Ella figure something out to lead Chloe to the murderer, but, ugh. Yawn. Dan is back in action having been reinstated when the department decided to sweep Malcolm and the Palmetto case under the rug. Though he's back in uniform, he has been demoted and is relegated to assisting on cases, Chloe being his first. No surprise there. What is surprising is that Chloe wouldn't have known about Dan's situation considering he's the father of her daughter and they work in the same department. Perhaps Chloe was just distracted with the whole Lucifer survives a bullet to the chest thing. Still, it's a bit bothersome, but I'm glad Dan is back as his interactions with Lucifer and Trixie are always a lot of fun to watch. 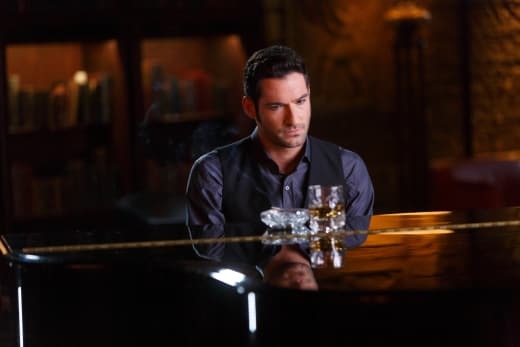 Lucifer Photos from "Everything's Coming Up Lucifer"
Lucifer continues to think that everyone under the sun is his mom returned to wreak havoc on his life, yet he doesn't realize he's the one doing all the wreaking. His newest person is Amy Dods who he visits only to discover, once again, that she definitely isn't mum. I didn't think he was going to escape her advances, but luckily Chloe saved him from any more hilarious embarrassment. I love the looks she gives him. Why can't she just believe? I didn't get the feeling she bought any of what Amenadiel told her. His explanations were more ludicrous than Lucifer claiming he is who he is. 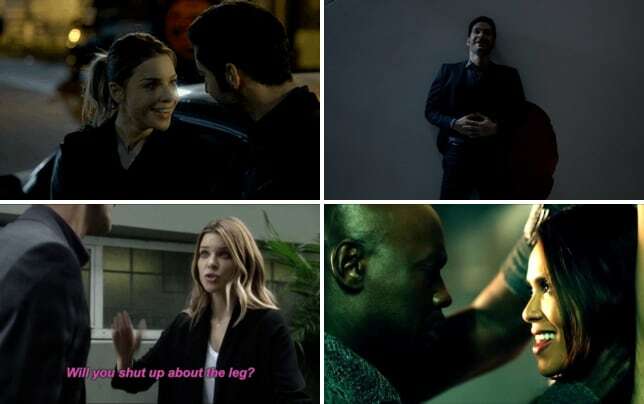 The only part that may have touched her was when Amenadiel talked about their broken home, and only because of what Lucifer shared later at the AA meeting. And I'm not talking about him loving drugs, which was the funniest delivery of the hour. But, then again, she did throw away the blood sample, so did she really believe what Amenadiel said? What's it going to take to open this woman's eyes?!! Amenadiel has some problems of his own. He's losing his power. Could it be because of his relationship with Maze or something more? He was pretty excited to see Maze had returned, but played it off quite well when she told him she needed space. Still, you could feel his disappointment. Maze returned just in the nick of time as Amy's boyfriend was going to stick it to Lucifer, quite literally. She didn't tell Lucifer where she was either, only a cryptic, "I was with a friend" which was easy to figure out once we saw her and Dr. Linda together later at Lux. Now that we are stuck here, I need to figure out where I fit in. Permalink: Now that we are stuck here, I need to figure out where I fit in. It was surprising, though, that Maze hasn't let her jealousy of Chloe go. She was not happy when Lucifer left after getting useful information from the tied-up boyfriend. I wonder if she's talked to Dr. Linda about Chloe at all yet? And what is Lucifer going to think when he catches Maze and Dr. Linda together, because you know he will! It turns out the murderer was Roberta, aka, Bobbi B., Jillian's friend and landlord. When Lucifer finds this out, he's not happy. His mother issues rise to the surface again and we get a look at his devil eyes as he leaves Chloe and heads over to Bobbi B. 's house alone. I'm not sure how I feel about Lucifer's banter with Bobbi B. He didn't get a chance to strut his stuff before she whacked him with the poker stick and almost knocked him out. I wasn't expecting that at all. If Amenadiel is losing his powers and now Lucifer, it can only mean that mum is near. It couldn't be anything else, right? Unless maybe Chloe being close by could have had something to do with it. Maybe whatever her powers are over him are growing stronger? I wonder how large his heart swelled? If only she would believe! We ended the hour with Lucifer singing an amazing version of Bob Dylan's "All Along the Watchtower" as the threads for the season were being tossed out. The biggest one of course being mum, who showed up at his door, but not in very good shape! What happened to her? I'm sure we'll find out! 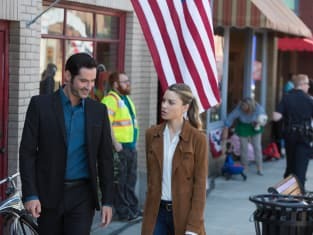 What did you think about "Everything's Coming Up Lucifer?" Do you like the addition of Ella? What's it going to take for Chloe to believe? Leave me a comment!